Arabs uprooted dozens of grapevines in a vineyard in the Admot Yishai (Tel Rumeida) suburb of Hevron, on land of the ancient Jewish community of Hevron. The vineyard was planted about 8 years ago and is cultivated by a farmer from the Jewish community of Hevron. 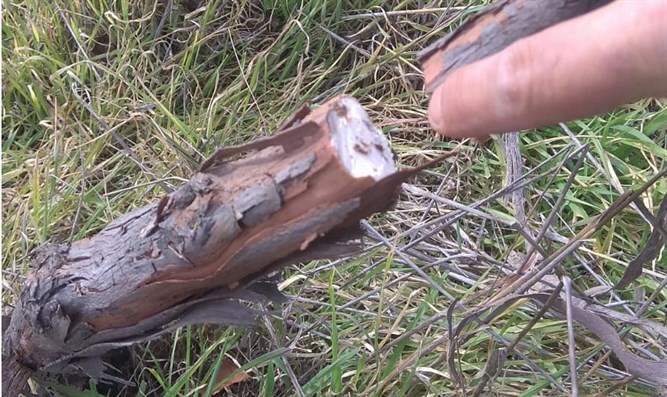 The vandals arrived in the vineyard early in the morning under the auspices of the nearby Hevron Municipality, who received a special permit from IDF forces to enter and perform conservation work on ancient olive trees near the Jewish area. The Arabs sawed through the vines causing irreversible damage to the vineyard. Attorney Chaim Bleicher of the Honenu organization, a Hevron resident who supervises land on behalf of the Hevron Land Commissioner, said: "The place is recorded by IDF security cameras, and we demand the immediate arrest of the vandals. This is a criminal act, uprooting dozens of grapevines in which money and hard work were invested. "This incident joins the many terror attacks carried out by Hevron Arabs against the Jewish community in the city, with the aim of uprooting the Jews from Hevron, just as their fathers did during the 1929 riots."